Editor’s Note: This is Episode 9 of the Fresno Poets Archive Project. 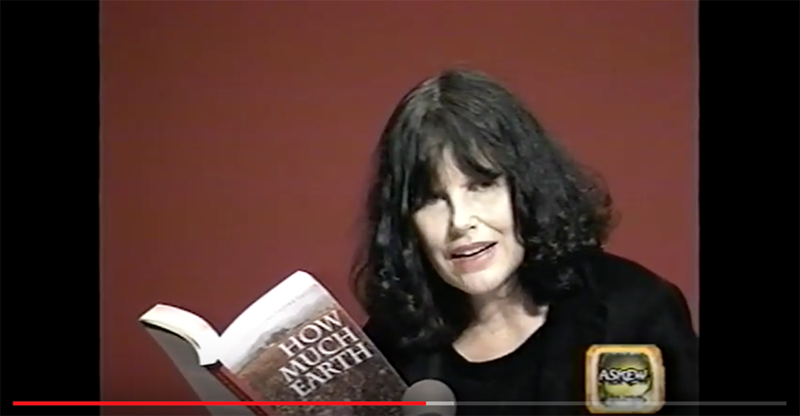 It features readings from the release of the “How Much Earth” anthology of Fresno poetry, recorded for Askew Poetry Journal, circa 2001 at the Fresno Metropolitan Museum in Fresno. Background research and closed captioning for this video was conducted by undergraduate student Ernesto Reyes in Fall 2017. Ernesto has lived in the Central Valley all his life. He is a senior, studying English literature and creative writing at Fresno State. He writes on a regular basis, and he enjoys reading the “descendents of Chekhov,” such as Raymond Carver, John Cheever, Alice Munro–and Chekhov himself. Ernesto plans on pursuing an MFA, and he hopes to write professionally and teach at a community college. Thoughts on Fresno writers, while researching and captioning the Askew Poetry Journal video from 2001. The poet David St. John called Larry Levis a close friend of more than 30 years before reading Levis’ poem “Anastasia & Sandman” with his usual coolness; but when he read, there was something in his voice, a tone, a desire perhaps, to honor his friend, who’d passed away in 1996. I hear the same something, though in different tones, whenever I hear someone speak about Philip Levine. How strange. I feel like in some way I’ve known Levine and Levis, and the other Fresno poets who are no longer with us, all my life, though I never had the privilege. It recently occurred to me that when I’m on the campus of Fresno State, I walk and enter into some of the same buildings as did Larry Levis and Gary Soto, Suzanne Lummis and Sherley Anne Williams. They were all once students here, yet strangely this idea had never occurred to me. I hadn’t realized until recently that they were even students to begin with. The other day, I walked into the Philip Levine Reading Room inside the Henry Madden Library. I took a seat and had a beautiful view of the university’s Peace Garden. When I turned, I imagined Levis, as tall and as long as he seems, resting his elbow on one of the bookshelves, casually reading a collection of poems, while William Saroyan, the great playwright and short story writer, a few seats ahead of me, sat stroking his huge handlebar mustache, looking out through the large window, curiously, just like me. In Fresno, a noun you don’t often use the singular “I.” The plural noun “We,” I think, is much more suitable. The We feels not like a group of students, teachers, or a classroom, but of an entire city, a community that goes beyond the classrooms on campus. Here, in Fresno, the We goes back at least 60 years. “This is a wonderful class, and you’re all such wonderful writers. Please think of submitting to the SJR.” That was my first time hearing of the San Joaquin Review journal. The San Joaquin Review? I like that name. I like that name a lot, actually. Type “Down at the Santa Fe Depot” — the “How Much Earth” anthology’s original predecessor — into Google search, and one of the top results will most likely be: “Down at the Santa Fe Depot: 46 Years Later,” posted on author Tim Z. Hernandez’s website. When I first came across this post, I meditated on the title for a bit. The Santa Fe Depot 46 years The San Joaquin Valley Fresno The Fresno Poets. As you scroll through the page, you’ll see the who’s who in Fresno’s current literary scene, from poets like Juan Luis Guzmán and Andre Yang, to prose writers like David Mas Masumoto, Aris Janigian, and Daniel Chacon. All standing together, in harmony. Towards the end of the post, you’ll find two wonderful, black-and-white photos of the past and present; these, I think, are the centerpieces of not just the webpage but, perhaps, of all that is creative writing in the Central Valley. You’re able to see, in one view, the rich literary history of this community. Despite not yet knowing (quite embarrassingly) half of the people in these photos, I still felt an incredible sense of connection, of togetherness, almost to the point that I knew about each and every one of them personally.